This fine and impressive antique snake brooch has been crafted in 18 ct yellow gold and silver in the form of a snake intertwined around a sword. The 18 ct yellow gold sword blade is plain and unembellished. The hilt of the sword is ornamented with a fancy hexagonal cut blue sapphire and eight pavé set Old Dutch cut diamonds. The silver snake that twists and entwines around the 18 ct yellow gold sword has a cushion cut blue sapphire set to the centre of it's head. 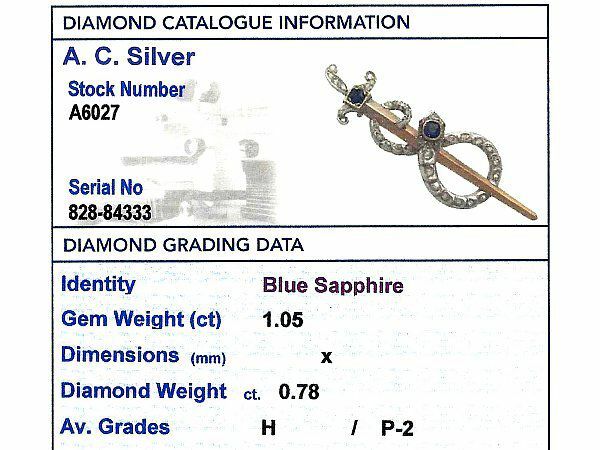 The body of the snake has a segmented scale design, each segment set with a collet set Old Dutch cut diamond. The brooch secures to the reverse with a hinged pin and clasp fastening. This impressive Victorian brooch has been independently tested using state of the art technology (Niton XL2 Analyzer) and verified as 18 ct gold and silver. This impressive antique 1880's serpent brooch is fine quality set with blue sapphires and very well colour matched, very high colour graded old cut diamonds. The brooch is a very good gauge of gold and is in excellent condition in keeping with age, however under magnbification surface blemished may be seen.